No. 42 on my 101 Things in 1,001 Days list is to do 1 eco-friendly thing and/or make 1 change per month. I have to admit I've been a bit behind on this one, so I decided to write a blog post each month to make myself more accountable. It seems appropriate to begin now, with Plastic Free July increasing in awareness. I made the change I'll be talking about today about 6 months ago, and it has a bit of a backstory: my first project was to change my relationship with plastic bags, and it was spurred on by an experience I had at that time. Husband and I were driving through the countryside on the way to visit a friend. Looking out the window, I saw some strange animals in the paddocks. In the distance, I couldn't quite tell what they were. Were they white birds, perched in the trees? Some were lower though, sitting on the ground. Were they lambs? They were moving in a strange way though, sort of waving up and down. More and more began appearing as we drove further, until the paddocks were full of them. I suddenly realised they weren't animals at all. They were plastic bags, caught on the trees and grass, billowing in the wind. Just as I was wondering where on earth they could have all come from, we drove past the entrance to the local landfill. It made me very sad to see the huge number of plastic bags littering the countryside. I decided to make reducing their use my first focus. The easiest way to use less plastic bags is to bring re-usable bags every time we go shopping. 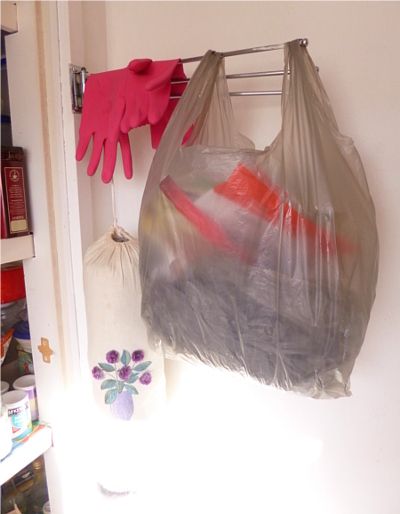 However, we have a big stash of plastic bags from the time before we starting being more conscientious. I didn't want to throw them in the bin, but I wasn't quite sure what to do with them. When we first moved into our house 2 1/2 years ago, we received brochures from the Council on how the bin collection and recycling work. The brochures said not to put any plastic supermarket bags in the bins as they can't be recycled. For a long time I thought this meant they can't be recycled at all. However, in my research I found out they can be recycled, it's just that our council doesn't have the type of facility to handle them. The two major supermarket chains here in Australia, Coles and Woolworths (the 'Big Two' or 'the Duopoly' as they're often called), give out plastic bags as a matter of course unless the customer brings their own re-usable bag. I wrote to the Managing Directors of both companies, urging them to stop providing customers with plastic bags, or to at least charge a fee for them. (I've never written a letter like that before, so I was a little nervous!) I tried to see the situation from their point of view, and wrote about the benefits to their profits, public image, etc, not just the benefits to the environment. Both wrote back with very similar stock letters explaining why they will not change, which is, sadly, pretty much what I expected. However it's interesting to note that Coles only took a week to reply, whereas Woolworths took a whole month. The reason for this is possibly because I pointed out that (unlike Coles) I could not find any information on their website about their environmental policies. I guess it took the extra time for someone to check their website? It still seems to be the case 6 months later. I actually found out from the Coles website about the REDcycle programme. This programme runs in both Coles and Woolworths stores. 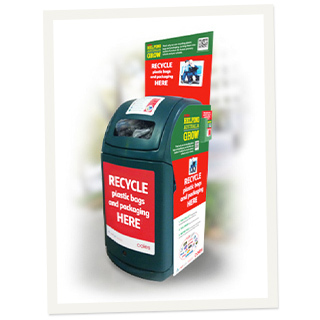 At the front of every store, there is a bin in which to drop off soft plastics, including plastic bags. 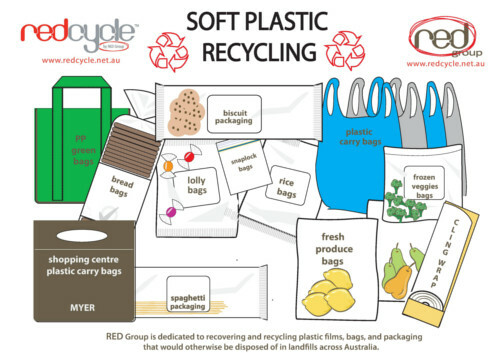 The bins also accept any kind of flexible plastic packaging (e.g. pasta packets), as well as damaged re-usable bags. They are then collected and turned into things like park benches and children's play equipment. It took me a little while to find the bin in my local Woolworths supermarket at first, as it was down the far end behind a large advertising sign. Weirdly, it moves around a little bit, but it's always there somewhere. We now use our stash of plastic bags to collect all our soft plastics in. I hang a bag above the bin on this convenient tea-towel drier one of the previous owners installed. As you can see, I use it for drying my rubber gloves! 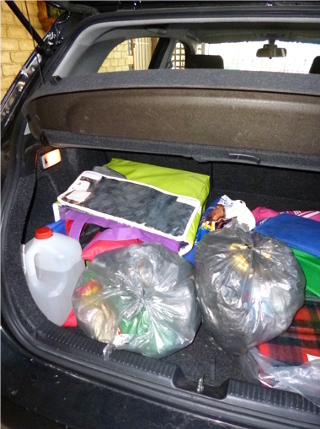 When the bag is full, I put it in the boot of the car. 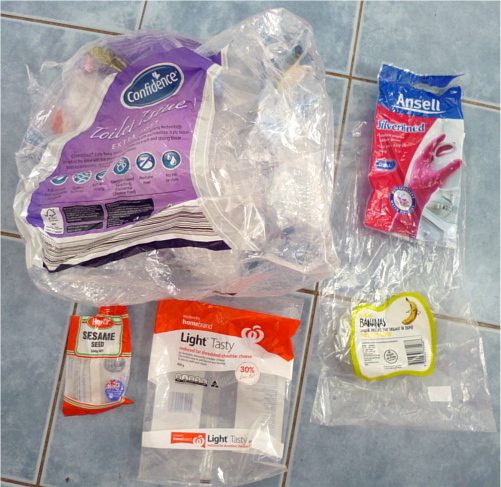 Next time we're at the supermarket, it's easy to grab it along with the re-usable bags and put it in the collection bin. Of course, the ultimate aim is to reduce or stop using plastic altogether, but at least this is a start. And voting with your wallet makes a big impact as well. Even though it's further away, we have been going to Aldi much more in the last 6 months, especially since I became gluten-free. Most items there are cheaper, but the gluten-free bread in particular is about half the price. Plus I'm supporting a company that is more environmentally aware. That sounds like a nightmare scenario, I'm sorry you had to see that :/ We have to pay for plastic bags in stores here now (even in some charity shops...), so I bring at least one eco bag everywhere with me, just in case >_>; I'm also sorry for the way those stores responded to you, that's seriously discouraging :< But if they have a pre-prepared answer, then that means you're not the only one who cares! Why not take it directly to the government, if there's a channel for you to do that...? Don't be sorry for your long comment! You had some great ideas, thank you! I'm only starting to think about these things after a long time of letting it slide (I have to admit!) so any tips or ideas are welcome. One state (not mine unfortunately) is bringing in compulsory fees for bags from next year. Hopefully the rest will follow soon, so perhaps now is a good time to write to the government.